It’s The 50’s All Over Again When The Change Flips The CD’s Right In Front Of You. 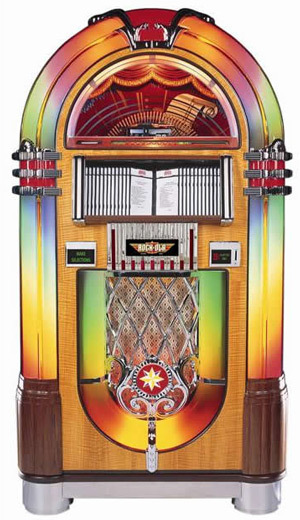 The most popular Jukebox of all time has been meticulously reproduced in the Rock-Ola Bubbler CD Jukebox, part of the Series V Bubblers. The bubbles of air perk merrily to the top of the 8 bubble tubes, while a kaleidoscope of color flows through 4 color translucent plastic cylinders. All 19 trim pieces are genuine die case metal, triple plated with copper, nickel, and polished chrome. With quality in mind, only the finest hardwoods adorn this beautiful jukebox. The handcrafted quality of these classics is a tradition Rock-Ola proudly continues. Incredible sound quality with 5 speaker, duel 3 way system for live performance reproduction. For pricing information on our Rock-Ola Jukeboxes give us a call at 304-728-0547. Or send us an email and one of our retro specialist will respond right away. We offer a great commercial customer discount when ordering in large quantities. Let us help you build your diner or retro restaurant.